iPhone 6 and iPhone 6 Plus smartphones has been officially released by Apple with the addition of several new features and functionalities, such as; Latest iOS 8 Firmware, Apple Pay Service etc. The Pre-Orders of iPhone 6 and iPhone 6 Plus is now available via Apple Store with 2-years on-contract basis and contract-free basis. The detailed Carrier Locked and Factory Unlocked iPhone 6 / iPhone 6 Plus Prices Across Countries Worldwide is available below. We are listing Comparison of iPhone 6 / iPhone 6 Plus Pricing (excluding taxes) By Countries, including; United States, United Kingdom, United Arab Emirates, Russia, Australia, Canada, France, Germany, Hong Kong, Japan, Puerto Rico, Singapore, Switzerland, Italy, New Zealand, Sweden, Netherlands, Spain, Denmark, Ireland, Norway, Luxembourg, , Austria, Turkey, Finland, Belgium and Portugal. 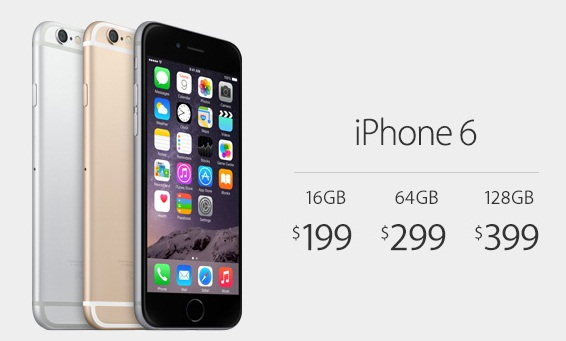 iPhone 6 and iPhone 6 Plus smartphones are available in three different colors i.e. Gold, Silver and Space Gray. Apple is offering two options, when buying an iPhone 6 or iPhone 6 Plus smartphones from Apple Store, Customers can either buy or purchase an iPhone 6 / iPhone 6 Plus as Carrier Locked or Contract-Free. The four major carrier includes; AT&T, Sprint, Verizon and T-Mobile. 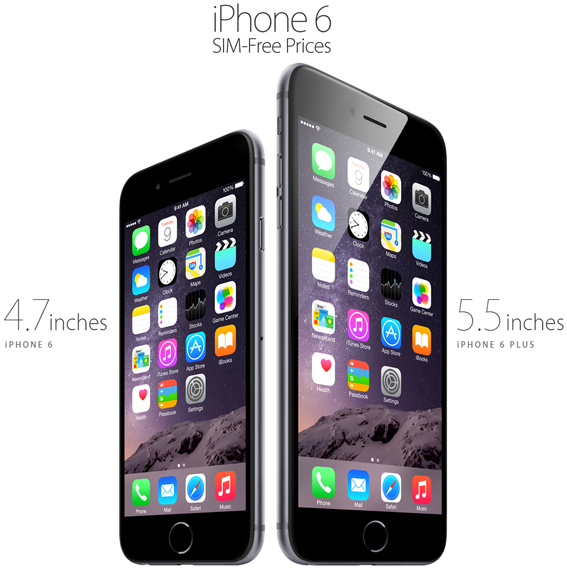 How to Order iPhone 6 / iPhone 6 Plus Smartphones Officially? You can buy any iPhone model with On-Contract or Off-Contract (SIM-Free) options. You can place your Pre-Orders for iPhone 6 / iPhone 6 Plus via Apple Store (US) | Apple Store (International) | Apple Store iOS App. If you place your orders today, then it’s expected that your iPhone device will be officially delivered closer to September 19th, 2014. Which is an official release date of iPhone 6 and iPhone 6 Plus. 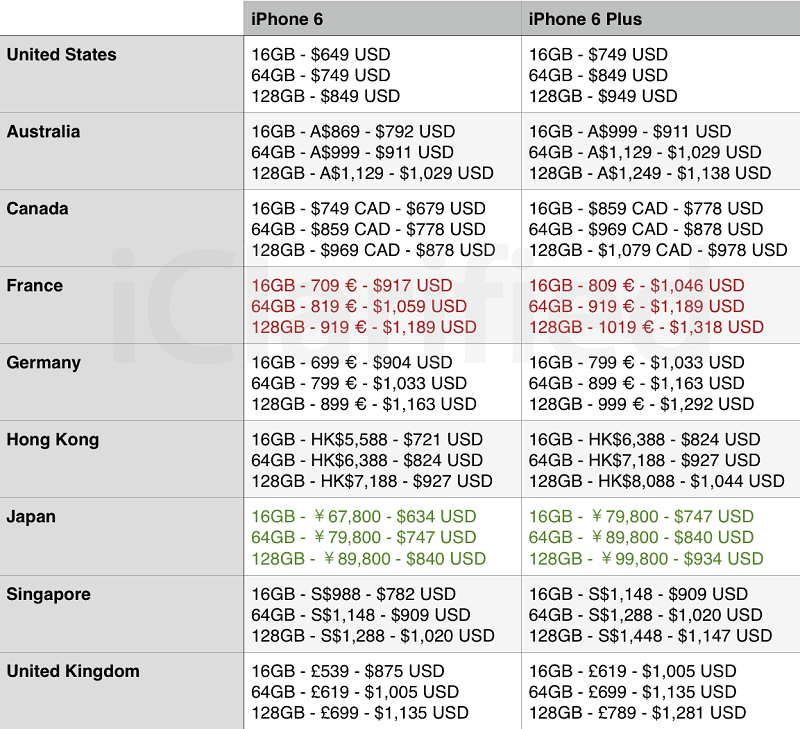 When comparing iPhone 6 different countries prices, The Cheapest iPhone 6 / iPhone 6 Plus in Price is available in Japan, not in United States. iPhone 6 / 16GB – 31 990.00 pyб. iPhone 6 / 64GB – 36 990.00 pyб. iPhone 6 / 128GB – 41 990.00 pyб. iPhone 6 Plus / 16GB – 36 990.00 pyб. iPhone 6 Plus / 64GB – 41 990.00 pyб. iPhone 6 Plus / 128GB – 46 990.00 pyб. iPhone 6 / 16GB – 5.199.00 kr. iPhone 6 / 64GB – 5.999.00 kr. iPhone 6 / 128GB – 6.799.00 kr. iPhone 6 Plus / 16GB – 5.999.00 kr. iPhone 6 Plus / 64GB – 6.799.00 kr. iPhone 6 Plus / 128GB – 7.599.00 kr.